Many downstream applications require expansion of NK cells prior to analysis. In vitro cultivation of NK cells often results in low expansion rates, exhausted phenotype due to long-term expansion, and overgrowth of conventional T cells if present in the initial culture. NK MACS Medium has a defined formulation that enables expansion of NK cells from peripheral blood mononuclear cells (PBMCs) or isolated NK cells. Expanded cells are fully functional and ready for downstream applications. PE buffer:	Phosphate-buffered	saline	(PBS),	pH	7.2,	with 2	mM	EDTA. ▲Note:	EDTA	can	be	replaced	by	other	supplements such	as	anticoagulant	citrate	dextrose	formula-A	(ACD-A)	or	citrate	phosphate	dextrose	(CPD). PBE Buffer: Prepare a solution containing phosphate-buffered saline (PBS), pH 7.2, 0.5% bovine serum albumin (BSA), and 2 mM EDTA by diluting MACS® BSA Stock Solution (# 130‑091-376) 1:20 with autoMACS® Rinsing Solution (# 130-091-222). Degas buffer before use, as air bubbles could block the column. ▲ Note: When using this kit the unwanted cell fraction is labeled and the target cells remain unlabeled. Depending on the target cell frequency, the labeled fraction can therefore represent the majority of the total cells. To avoid blocking of the column, do not exceed the max. number of labeled cells per column. Estimate the number of labeled cells in the sample, split the sample if necessary and use the appropriate number of separation columns. Human AB serum or autologous plasma. Availability is country-specific. The	peripheral	blood	or	buffy	coat	should	not	be	older	than	8	hours	and	supplemented with	anticoagulants	(e.g., heparin,	EDTA,	citrate,	ACD-A,	or	citrate	phosphate	dextrose	(CPD)). Dilute	cells	with	2–4×	the	volume	of	PE buffer. ▲ Note:	The	more	diluted	the	blood	sample,	the	better	the	purity	of	the	mononuclear	cells. Carefully	layer	35	mL	of	diluted	cell	suspension	over	15	mL	of	Ficoll-Paque™ in	a	50 mL	conical	tube. Centrifuge	at	400×g	for	30–40	minutes	at	20	°C	in	a	swinging-bucket	rotor	without	brake. Aspirate	the	upper	layer	leaving	the	mononuclear	cell	layer	(lymphocytes, monocytes,	and	thrombocytes)	undisturbed	at	the	interphase. Carefully	transfer	the	mononuclear	cell	layer	to	a	new	50	mL	conical	tube. Fill	the	conical	tube	with	PE buffer,	mix,	and	centrifuge	at	300×g	for	10	minutes	at	20	°C. Carefully	remove	supernatant	completely. 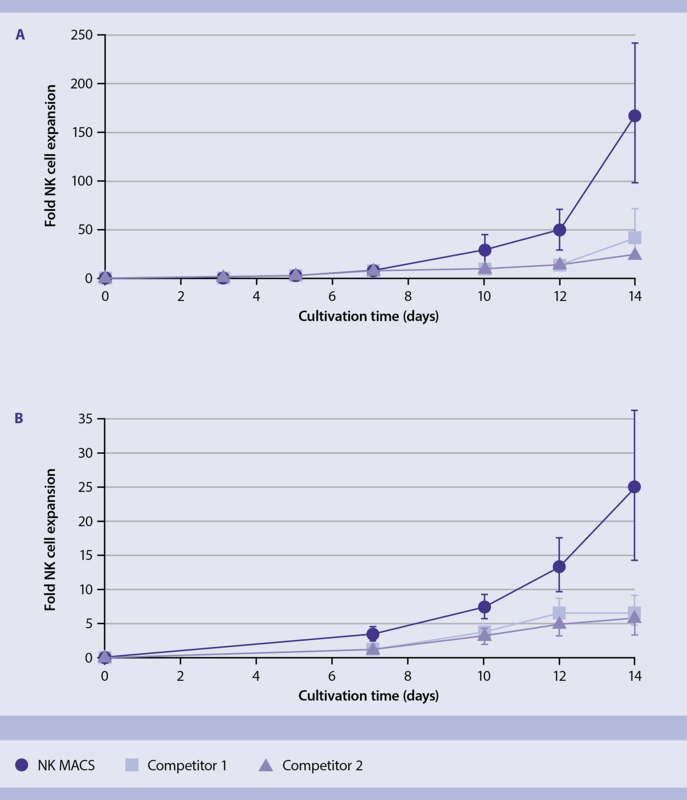 For	removal	of	platelets,	resuspend	the	cell	pellet	in	50	mL	of	PE buffer and	centrifuge	at 200×g	for	10–15	minutes	at 20	°C. Carefully	remove	the	supernatant	completely. ▲ Note:	This	step	will	increase	the	purity	of	the	target	cells	in	the	subsequent	MACS®	Cell	Separation. Repeat	step	7. Most	of	the	platelets	will	remain	in	the	supernatant	upon	centrifugation	at	200×g. Resuspend	cell	pellet	in	an	appropriate	amount	of	PE buffer and	proceed	to	"Isolation of NK cells". ▲ Note:	PBMCs	may	be	stored	in	the	refrigerator	overnight	in	PBS	containing	0.5%	BSA	or	autologous serum. Do	not	store	cells	longer	than	one	day	in	the	refrigerator. Wash	at	least	once	before	proceeding	to magnetic	labeling	and	resuspend	cells	in	an	appropriate buffer. For	details	see MACS Cell	Separation Reagents data sheets. Isolate pure and fully functional NK cells using the NK Cell Isolation Kit, human. This indirect magnetic labeling system isolates untouched NK cells from human PBMCs by magnetically labeling and depleting non-NK cells (i.e., T cells, B cells, stem cells, dendritic cells, monocytes, granulocytes, and erythroid cells) with a cocktail of biotin-conjugated antibodies and the NK Cell MicroBead Cocktail. Follow the protocol in the kit data sheet. Volumes given in the data sheet for each antibody are for up to 1×10⁶ or 1×107 nucleated cells. Follow the instructions provided. Centrifuge cell suspension at 300×g for 10 minutes. Discard supernatant. Resuspend according to the data sheets of the antibodies used. Add antibodies according to the dilution listed in the antibody data sheets. Wash cells by adding 1−2 mL of PBE buffer per 1×10⁶ cells and centrifuge at 300×g for 5 minutes at 4 °C. Discard supernatant. Proceed immediately to "Flow cytometry analysis". Perform the purity analysis with a cell sample taken before cell separation and a cell sample taken after isolation. When working with PBMCs as starting material, analyze only the original sample. Identify lymphocytes by SSC/CD45 gating. Ex vivo cultivation is an attractive option to increase NK cell numbers for functional analyses, including anti-tumor potential. Miltenyi Biotec NK MACS® Medium addresses the major challenges of culturing NK cells with a uniquely designed formulation that expands fully functional NK cells from either PBMCs or isolated NK cells. The medium is xeno-free and enables superior NK cell expansion with minimal growth of unwanted cells, like B, T, or DC cells. ▲Note: supplementation with serum or autologous plasma is necessary. Before NK MACS Medium can be used, NK MACS Basal Medium and NK MACS Supplement (provided) must be mixed. Thaw NK MACS Supplement at 2–8 °C. Add 1% of NK MACS Supplement to the NK MACS Basal Medium, e.g., add 1 mL of supplement to 100 mL of basal medium. Add 5% AB serum. Mix well. This is complete medium. ▲ Note: Only prepare the amount of complete medium which is used within 3 weeks. Complete medium can be used up to 3 weeks when stored at 2–8 °C. Do not freeze. Prior to use for expansion, add 500 IU/mL of IL-2. This is expansion NK MACS medium. Determine the total number of cells. Wash cells by adding 5–10 volumes complete medium (see "Things to prepare in advance") to the cells and centrifuge at 300×g for 10 minutes. Discard supernatant. Resuspend cells at a concentration of 1×10⁶ cells/mL in expansion NK MACS medium (see "Things to prepare in advance"). Pipet 300 µL of cell suspension into each well of a 24 well-plate (roughly 3×105 cells/well). ▲ Recommended: use residual volume for cell count determination. Sampling or changing a flask: NK cells attach to the bottom of a plate or flask. Carefully scratch cells off the surface with a 1000 µL tip pipette and resuspend cells at least 5 times. Always handle cells gently. After 10 days, aggregates may appear. This is not unusual. NK cell expansion is donor-dependent. The estimated volumes listed below are an example and may vary. NK cells can also be expanded for longer than 14 days, though success is also donor-dependent. Take a 50 µL sample of cells to determine cell count (w/o stain, just PI/7-AAD + Scatter). If the cell density is less than 1×106 cells/mL, double the culture volume with fresh expansion NK MACS medium (in the case illustrated by this protocol, add 250 µL). If the cell density is greater than 1×106 cells/mL, add enough fresh expansion NK MACS medium to dilute cells to a final concentration of 4–5×105 cells/mL (e.g., if cell density on day 7 is 1.5×106 cells/mL, add 500 µL of fresh medium to the existing culture volume of 250 µL. Total volume will then be 750 µL and final cell density 5×105 cells/mL). Add enough fresh expansion NK MACS medium to achieve a final cell concentration of 4–5×105 cells/mL. NK cells can be expanded using PBMCs as starting material or NK cells isolated from whole blood, buffy coats, or PBMCs. 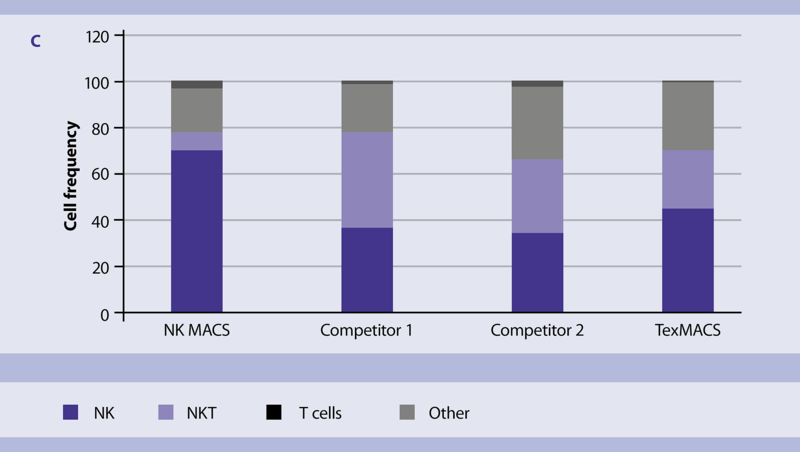 Using NK MACS Medium results in 3 times greater fold expansion of NK cells compared to other media or TexMACS Medium for T cells. Illustrated are NK cell fold expansion from (A) PBMCs (n=3) and (B) isolated NK cells (n=3) using 5% AB serum and 500 UI/mL of IL-2. Limited expansion of non-NK cells. When PBMCs are used as starting material, NK MACS Medium favors expansion of NK cells compared to other media or TexMACS Medium for T cells. The defined formulation limits growth of unwanted T (CD3+), NKT (CD3+CD56+), and other cells (e.g., CD3–CD56–). Illustrated is the cell composition of PBMC cultures after 14 days of expansion in different culture media. NK cells cultivated in NK MACS® Medium retain their natural cytotoxicity against the K-562 cell line and are suitable for any downstream applications, including cytotoxicity assays and flow cytometry analysis. Retained cytotoxicity of expanded NK cells. 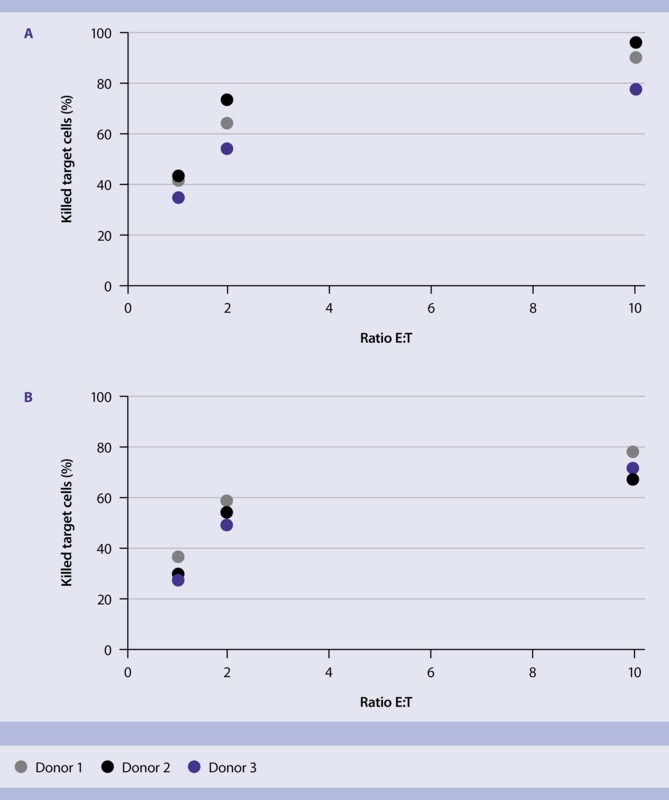 NK cells were expanded for 9 days in NK MACS Medium starting from (A) PBMCs and (B) isolated NK cells and their cytotoxicity against K-562 cells was measured by flow cytometry at different effector-to-target (E:T) ratios.